Thank you Decoy for sponsoring this post. Celebrate International Merlot Month this October by using the hashtag #MerlotMe on social! 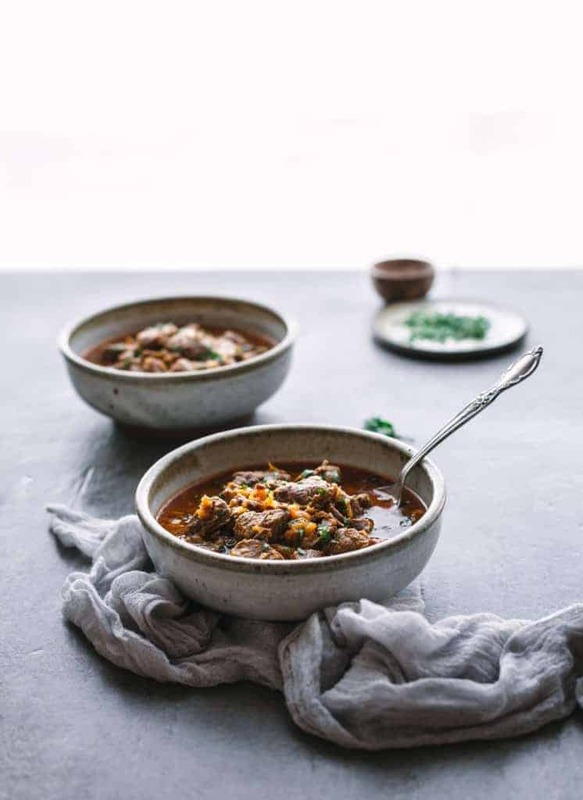 Instant Pot Lamb Stew with Apricots recipe. The best lamb stew ever! It’s so hearty and comforting. It’s a one pot meal with simple ingredients, perfect for any weeknight or special occasions. A delicious lamb stew that is made without flour or butter. October is International Merlot month, a global industry event celebrating the noble Merlot varietal all month long. Over 100 Merlot producers from around the world participate. How to be part of the merlot movement? Get your hands on a fine bottle of Merlot, obviously! Merlot goes down well at home or out at a restaurant. Attend a #MerlotMe tasting. Just get some Merlot in your glass! The best part about #MerlotMe is finding something new to try, or finding others who love the same Merlot as you. Follow the hashtag and chat with others who are sharing their #MerlotMe moments as well. 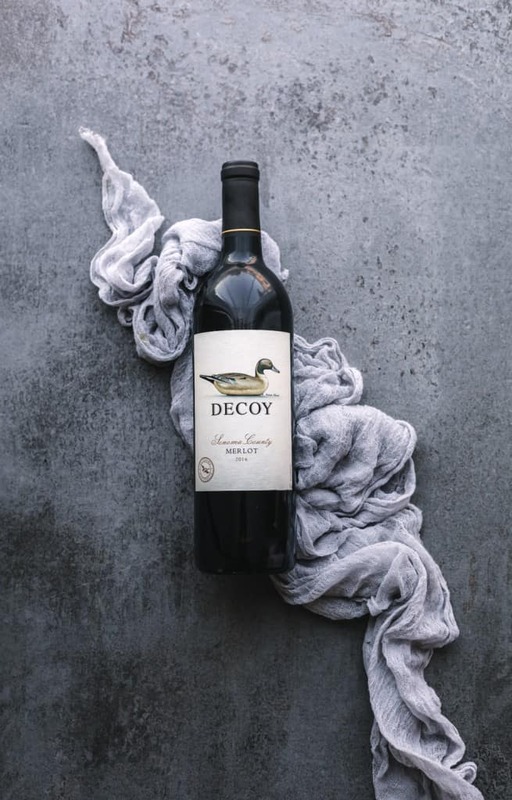 Decoy Sonoma County Merlot is an outstanding choice for a bottle this season. A case may be a better way to go as their tagline is that it’s the “everyday bottle for the well informed”. The bottle boasts complex but smooth layers of black cherry, blueberry and cassis, with hints of both vanilla and cocoa. 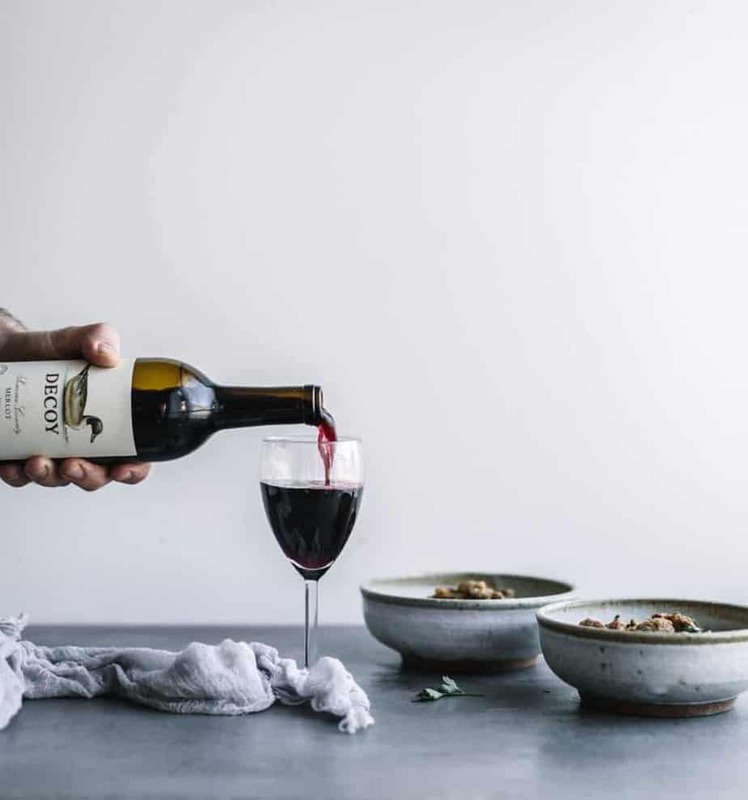 My palate for wine is not as refined as those in the industry but we like to have a glass before reading about the flavors, then have another glass (or more) after learning about the wine. As big fans of black cherry in-particular this bottle was a pleasure to drink. There are a number of things that I appreciate about Duckhorn Vineyards, the makers of this fine bottle. For one, they’ve been around for over four decades fine tuning their craft. That is something to definitely look for in the complex wine industry. A second thing that I enjoy is the details they share on their website about their wine varieties. This Merlot was a 2016 and I was able to read about the rain and sun for that crop, and how it affected the richness and acidity, color and concentration. Lastly I appreciate their location. I worked in the restaurant industry for some time in Sonoma and Napa and was fortunate to have many a bottle of outstanding wine up there…. nothing quite compares to it! Speaking of red wine, people often use it as a component in a stew. 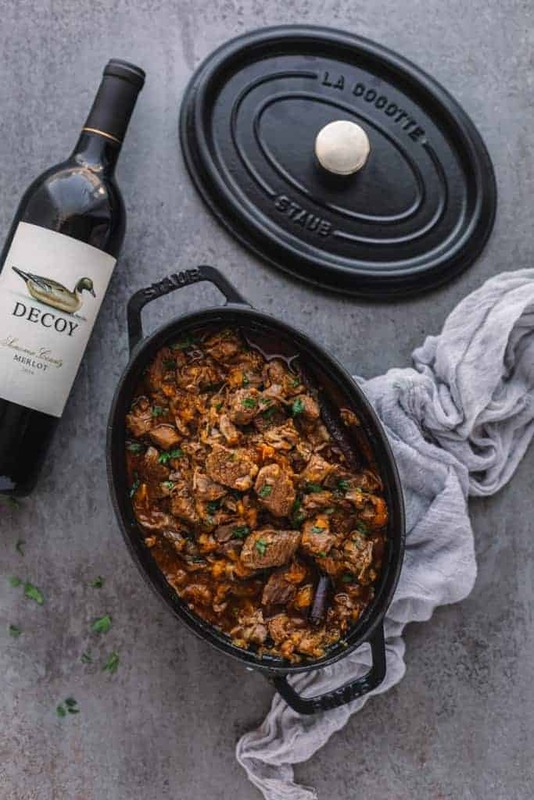 The following Instant Pot Lamb Stew with Apricots recipe does not, so you can just enjoy your glass of Decoy Merlot as a pairing instead of as an ingredient, yum! 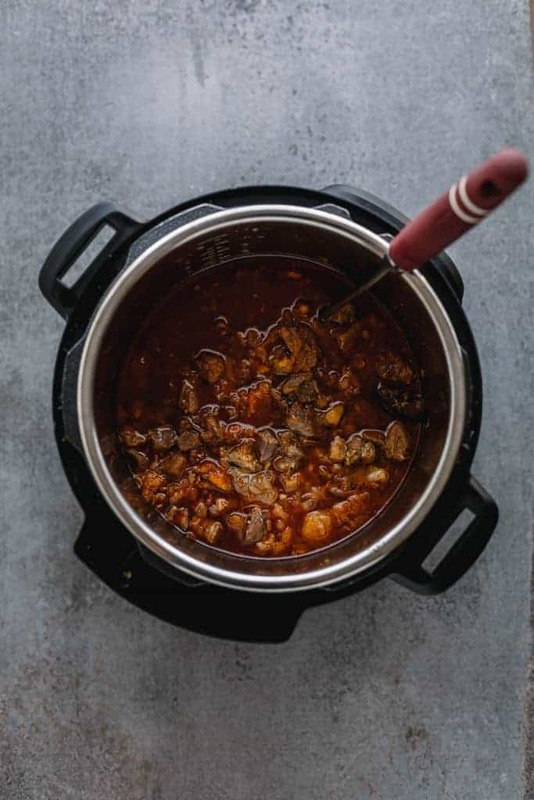 If you are looking for an Instant Pot stew recipe then keep reading. This stew recipe that will keep you warm this fall and winter. 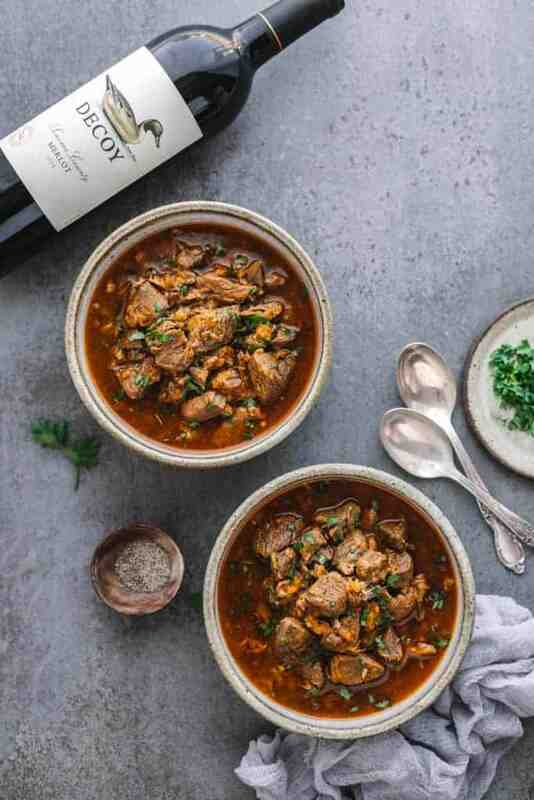 This instant pot lamb stew is the perfect comfort food on a chilly evening. I’m proud of how this recipe comes out, I think it will be a keeper and atop your recipe list for lamb stew! 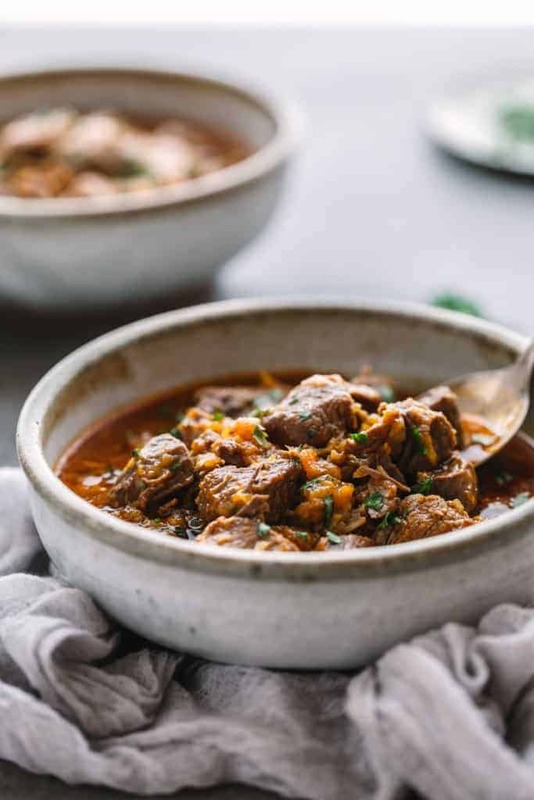 The tender lamb meat will fully melt-in-your-mouth, and the broth has a deep and rich flavor This one-pot meal of instant-pot lamb stew is loaded with hearty and healthy ingredients, perfect for any weeknight or special occasions. This lamb stew is not a traditional stew but don’t worry because you only need simple ingredients that you can easily find in your pantry: cinnamon, coriander, salt, black pepper, ginger, turmeric also some fresh ingredients of: boneless lamb leg, beef broth, onion, garlic, tomato paste, fresh ginger, and also dried apricots. 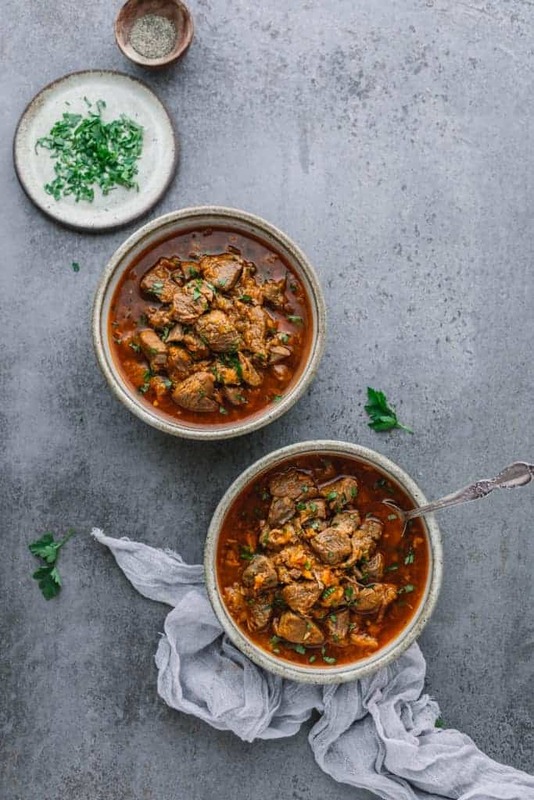 This Instant Pot Lamb Stew with Apricots recipe is fast and easy, but is packed with slow-cooked flavor and tenderness. Make this stew using instant pot and you will spend less time in the kitchen and it can be ready in about 45 minutes. This lamb stew contains no flour and no wine, but the sauce has a great consistency. If you have some leftover lamb meats, be sure to to try these Slow Cooked Lamb Ragu Slow Cooked Lamb Shanks recipes. In a skillet over medium heat, cook the lamb until browned for about 5 minutes per batch. Set aside. Turn the instant pot setting to "Saute", add oil, garlic and cook until fragrant. Add chopped onion and cook for about 30 seconds. Add cinnamon stick, coriander, black pepper, salt, turmeric, ground ginger, grated ginger, salt and ground cinnamon. Keep stirring until fragrant for about 15 seconds. Add browned lamb leg cubes into the instant pot. Stir for a few seconds. Add dried apricot, cinnamon stick and the broth, turn off the "Saute" setting, close the lid and set to "Manual" for about 35 minutes. Release pressure using the natural-release method. Unlock and remove the lid. Serve the lamb stew immediately with rice. You may also brown the lamb meat using instant pot. Leg of lamb is great for barbecue or roasted and it works really well as a stew or curry. If you can't find leg of lamb, use Lamb shoulder instead. Stew is a perfect winter meal. It always warms me up on a cold winter day. This sounds delish. Your stew looks amazing! I’m all about stews once it turns cold and I love that it’s cooked in the instant pot. Yum! This sounds so good. The flavors of lamb and apricot are perfect together. I can’t wait to make this. It’s the perfect meal for the cooler weather. Yum, this looks so scrumptious. I love a good stew, especially when it’s cold out. I need to start using my Instant Pot more often! That stew looks so good. We raise sheep so I am always looking for new recipes to try using mutton Thanks! Now this sounds absolutely delicious and just perfect for this time of year. Lovely and warming for a nice evening meal. The sounds and looks so delicious. I cannot wait to try it. Anything in the instant pot that I have made has come out with major flavor and delicious. My husband and son in law love lamb. I am going to have to share this with them. They love to cook, so this would be a great thing for them to collaborate on! This recipe looks so savory and perfect for the colder weather we’re having in my state. The perfect comfort food. I love lamb and I’m sure I will love your recipe. Definitely making this for my family. This looks like a really good recipe. I’ve never actually tried lamb before though. I’d be willing to give it a try just to try this recipe. What an interesting and delicious flavor combo! A must try recipe! Yummy! Wow this is a delicious looking recipe! Lamb is not used enough! Ooh now that looks super appetizing. i would love to jam some of this! Oh, this is looks so deliciously made. I need to try this too but I have to check out first the availability of the product here in my location. Hopefully its available. The recipe is outstanding. I would so love to try this. I’m Vegan so I cannot =( but GOOD NEWS!!! My husband is not a Vegan and he is the cook of our house and how much he would love to try this recipe. He’s a lover of all things “wine” and when we first dated I remember be made chicken with wine in it, It was so good (back in my non-vegan days). Thanks for this! !